As a resident of a housing co-operative, you will participate in a unique form of home ownership for Canadians. In a housing co-op, members jointly own the entire project and lease particular units for their exclusive use – in a sense, co-op members are both landlords and tenants. By establishing their own rules and policies, setting their budgets, and taking democratic control of the management and administration of their co-op, members share the benefits and responsibilities of home ownership. As a part of a national and international movement, members also share democratic principles and a rich heritage with thousands of others around the world. Housing co-operatives are incorporated and regulated under provincial law, which gives them special status as not-for-profit organizations. In most housing co-ops, only members have occupancy privileges. Most housing co-ops receive financial assistance from the federal government (through the Canada Mortgage and Housing Corporation), in the form of mortgage guarantees and subsidy funding for income-tested members. The guarantees help secure construction financing, while subsidies reduce effective mortgage interest rates, keeping housing charges in line with the lower end of rates charged for similar accommodation in the rental market. For members who meet certain low-income guidelines, co-ops are often able to offer special, affordable rates, usually 30% of gross household income. 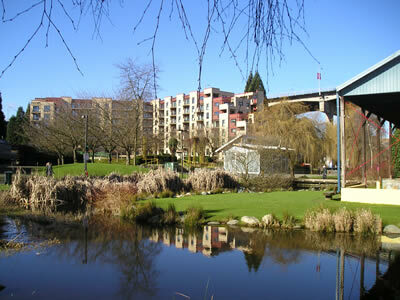 (Creekview Co-op is not offering housing subsidies to new members at this point in time). Members are required to purchase shares in their housing co-op prior to occupancy, in amounts typically ranging from $2000.00 to $3500.00 depending on the co-op and the unit size desired. These shares do not bear interest and are usually refunded within 90 days after move-out (less any deductions for damages or debts owed to the co-op). In order to provide a self-governing and co-operative community for members and to keep costs low by sharing the work, all Co-ops prefer members who will make a firm commitment to participation. This means regular attendance at meetings, serving on committees or work parties, and practicing the principles of co-operation in dealing with neighbours and the co-op as a whole. UNLESS YOU ARE PREPARED TO MAKE A COMMITMENT TO PARTICIPATE, AND CARRY IT THROUGH DURING ALL THE TIME YOU ARE A RESIDENT, CO-OP HOUSING IS PROBABLY NOT FOR YOU! When you are interviewed by a co-op’s selection committee, don’t hesitate to ask for details of the co-op’s organization, finances, housing charge and share policies, participation requirements, and. policies. By becoming informed, you’ll be able to make the best housing choice for you and your family. We think you’ll like what co-ops have to offer, if you have something to offer in return.